Expedia has some excellent Downtown Los Angeles package deals Bundling your bookings is a surefire way to save cash and time — and get your adventure off on the right foot. Secure your deal on Expedia and gain savings of up to 40,450 YEN*! It's really that simple! There's no need to look around a bunch of websites for your travel bookings. With more than 400 partner airlines and 321,000 properties around the world, our expansive database has all that you need. You can alter your travel reservations with us because we do not charge cancellation fees for almost all of our reservations. Getting fired up about your trip to Downtown Los Angeles? Need a few pointers about what to see when you arrive? That's where we can assist! The Microsoft Theater and Walt Disney Concert Hall are easily accessible from this neighborhood. Since they're just a stroll away, remember to bring those sneakers. Get together with like-minded peers and be inspired at one of the events or conferences held at Los Angeles Convention Center. There's an excellent range of things to do in this destination. L.A. Live is a popular hangout for tourists and locals alike. Set aside enough time to meander about and discover everything this precinct has to offer. Still got some time to spare? It's been said that music is the shorthand of emotion. At Grammy Museum you can get an education in one of mankind's most glorious art forms. Traveling isn't about famous destinations and plush hotels. It's about the experiences you have and the wonderful memories you collect along the way! For more things to do, check out our Downtown Los Angeles things to do page. With a variety of accommodations offered in Downtown Los Angeles, you'll always be able to discover one that's ideal. Cheap vacations and luxury getaways — Expedia has everything you'll need. There's no need to blow all your budget on a place to kick your feet up. You'll find decent beds with a reasonable price tag at the Jerry's Motel (285 Lucas Avenue) and the Kawada Hotel (200 S Hill St). Downtown Los Angeles isn't short of upmarket accommodations either. If you prefer, rest your head in style at The Ritz-Carlton, Los Angeles (900 W. Olympic Blvd) or the LEVEL Furnished Living Suites (888 S. Olive St). Trying to find out how to make the trek from Los Angeles International Airport (LAX) to Downtown Los Angeles? Once you've picked up your luggage, you'll be around 11 miles (18 km) to the southwest of the neighborhood. 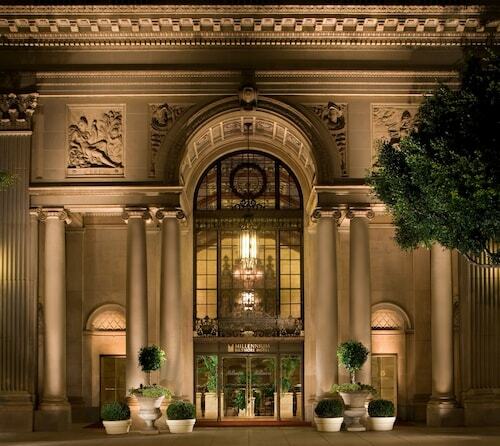 Located in Downtown Los Angeles, this luxury hotel is within a 10-minute walk of The Bloc and Pershing Square. Grammy Museum and Staples Center are also within 15 minutes. 7th Street - Metro Center Station is only a 3-minute walk and Pershing Square Station is 14 minutes. 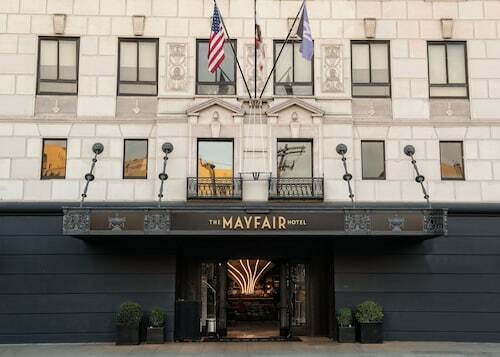 Located in Downtown Los Angeles, this hotel is within a 15-minute walk of Jewelry District, Walt Disney Concert Hall, and Grand Central Market. The Broad and Pershing Square are also within 15 minutes. 7th Street - Metro Center Station is 11 minutes by foot and Pershing Square Station is 13 minutes. 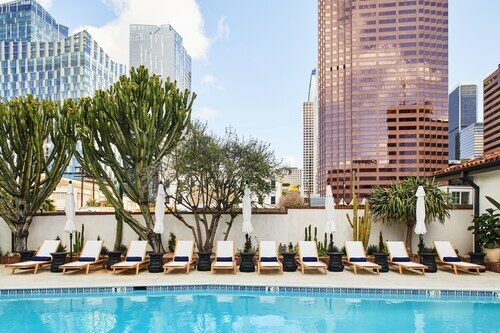 Located in Downtown Los Angeles, this hotel is within a 5-minute walk of Grand Central Market and The Broad. Walt Disney Concert Hall and Pershing Square are also within 15 minutes. Civic Center Station is only a 2-minute walk and Pershing Square Station is 9 minutes. 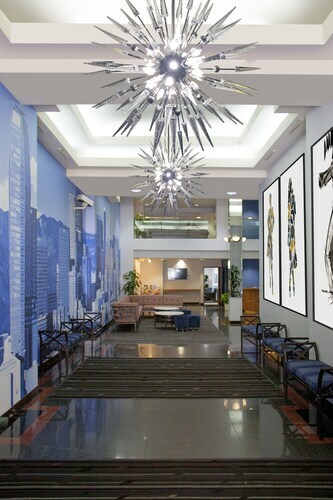 This central-downtown hotel is four blocks from the Performing Arts Center of Los Angeles, home to the Walt Disney Concert Hall and other famed cultural venues; the convention center is a mile away. 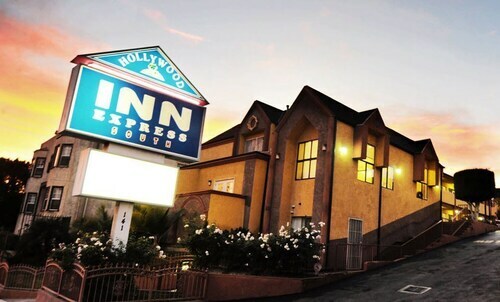 Less than 2 miles from downtown Los Angeles, this hotel is also less than 8 miles from Universal Studios and the Hollywood Walk of Fame. Located in Koreatown, this hotel is within 3 mi (5 km) of Wiltern Theatre, Melrose Avenue, and Los Angeles Convention Center. L.A. Live and Microsoft Theater are also within 3 mi (5 km). Wilshire - Normandie Station is only a 2-minute walk and Wilshire - Western Station is 10 minutes.